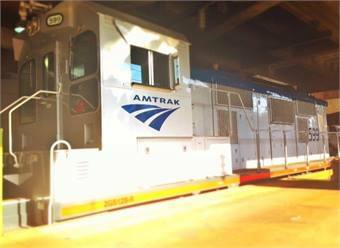 To celebrate Earth Day on Tuesday, Amtrak highlighted a project that replaces the engines in two locomotives with new energy-efficient generator sets at terminals that switch railcars between trains and in shop facilities. The newly-repowered Generator Set “GenSet” locomotives are now used daily in Washington, D.C. Amtrak previously began using GenSet locomotives in Los Angeles; Oakland, Calif.; and Chicago. Traditional locomotives have a large diesel engine idling continuously when in service. GenSets have two or three smaller, independently controlled engines that shut down when not in use. The engine configuration helps reduce diesel fuel consumption by about 50% and produces fewer pollutant emissions. A $1.8 million Diesel Emissions Reduction Act grant awarded through EPA’s National Clean Diesel Funding Assistance Program is supporting the repowering of two older switching locomotives into GenSet locomotives for use at Amtrak facilities in Washington D.C., and in partnership with the Metropolitan Washington Council of Governments (COG) and the Brotherhood of Locomotive Engineers and Trainmen/District of Columbia–State Legislative Board.